Styrofoam balls are an easy item to use in making centerpieces and other decorations for your home. This is a guide about making Styrofoam floral balls. Take Styrofoam ball, pull heads off of silk flowers and glue and press into Styrofoam ball. 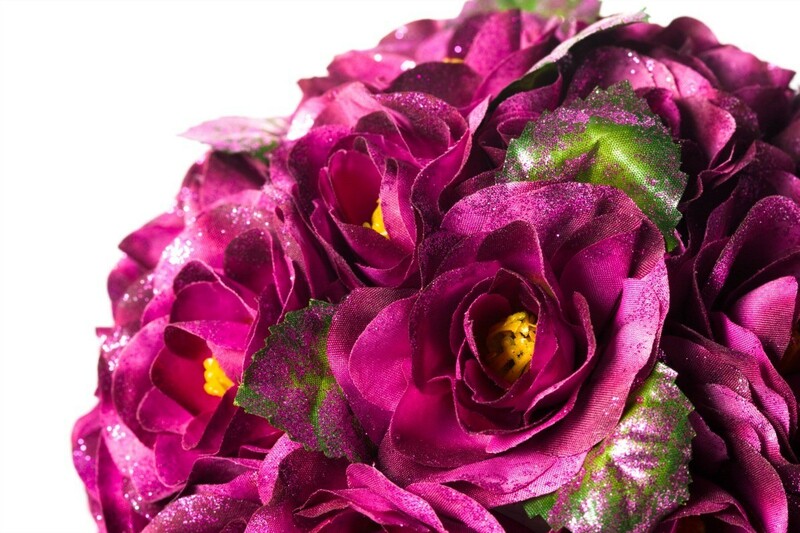 Glue silk leaves from silk flowers throughout ball. Hot glue matching ribbon so you can hang. This cute craft is a great way to welcome spring. Have the kids help and use these balls to replace candles for a floral theme. It's as easy as just sticking fake flowers into a styrofoam ball and enjoy. Snip each flower off the stem, leaving a small point. Drizzle a bit of glue on the point and push it into the styrofoam. Repeat process until entire flower is covered. 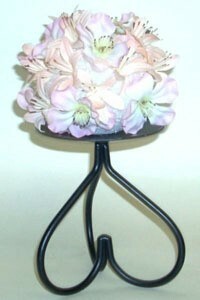 This is a great way to use up old or left over fake flowers. If you don't have any on hand, try a local thrift store where you can get a variety on the cheap. I made three of these balls, one from a 3 inch ball and the two others from 1 inch balls. I then set the balls out on my candle holders instead of candles. You can paint the Styrofoam green before pushing in the flowers if you like. However, I preferred the crystal twinkle of the raw Styrofoam with my light beige and pink flowers. These small and elegant decorations are perfect for throwing a formal, black-tie affair, such as wedding, prom, anniversary, graduation and the like. 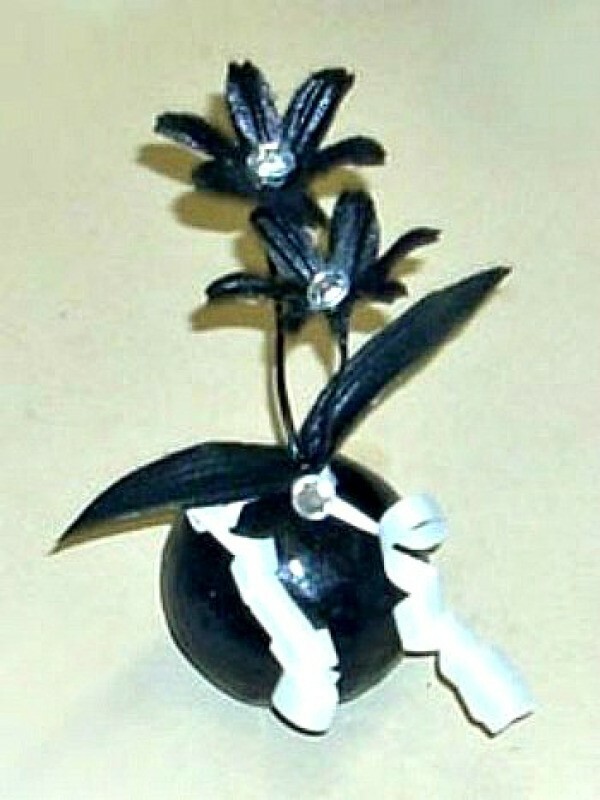 The small black ball holds two black flowers on black stems. Each flower contains a clear gem center and the ball is decorated with a simple white ribbon. I suggest you buy the Styrofoam-like balls that are already smooth and ready to paint. If you do buy a regular Styrofoam ball, make sure to use plaster of Paris, mod podge, or foam finisher on it. First push the bottom of the ball slightly flat, so that it sits securely on a table. Cover the ball in a light layer of the finish and let dry. Sand everything smooth, clean off, and apply another thin layer. Let dry. Sand everything smooth and clean off. Your Styrofoam ball should now be hard, smooth, and still ball shaped. Now it's ready to paint black, as detailed in the instructions. The fake flowers can be any size, just make sure they are fabric. You're going to spray paint them black, so it doesn't matter what color they are. If they have anything sticking out from the center, make sure you can remove it or cut it off. The flower center needs to be pretty much flat, so that you can glue the gem there. The flowers need to be on the delicate and/or small side. Not only does this look better, but it keeps the flowers from being so heavy that they knock over the ball "vase" holding them. Flatten the bottom of your foam ball, so that it sits securely on a table. 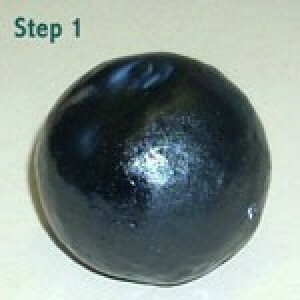 Spray paint the ball black, as shown in the "Step 1" picture. Let the ball dry. Paint with a second coat and let dry if needed. If you are using Styrofoam with a finisher, such as Plaster of Paris or Mod Podge, you can use any kind of black paint. If you are painting raw Styrofoam, make sure you are using "Styrofoam safe" black craft paint. Cut the flower stems to the right length if needed. Stick the end of the stem into a piece of scrap foam, or anything else that will hold it upright and in place. 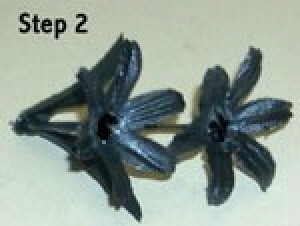 Hold the can back from the flowers and cover them in a heavy, even layer of black paint, as shown in the "Step 2" picture. Before the flower is totally dry, separate any petals that may be sticking together. Then let dry. Take the flower from whatever was holding it and turn them upside down. Spray an even layer of black paint. Let the paint drip for a few seconds, then turn the flowers right-side up. Place the flowers back in their holder and let dry. Your flowers and stems should now be covered in black. The paint should soak into the fabric petals, making them black and a little stiff, but still flexible. If the spray paint has caused any fraying of the leaves or petals, just carefully nip them off with sharp scissors. Dab a little glue to the back of a clear gem. Press the gem into the center of a flower and hold for 10 seconds. 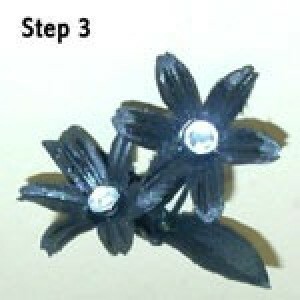 Let dry, then repeat with remaining gem and flower, as shown in the "Step 3" picture. Using either the flower stem or a toothpick, poke a small hole in the top of the ball. Add a little glue to the end of the stems and push the flowers into the hole. Push at least 1 inch of stem into the ball, or however much you need so that the flowers stand up. Let dry. 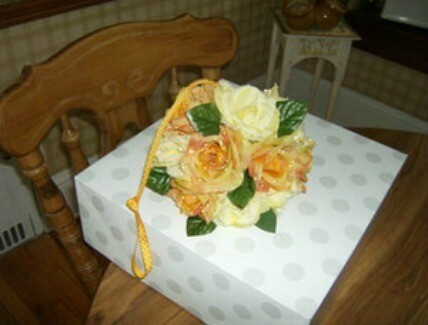 Tie the ribbon around the base of the flowers and secure with a knot. Make the ribbon spiral by running it against the edge of a scissor, as shown in the finished project picture. Glue a clear gem over the knot. Let dry. We made several of these decorations for a high school prom. Each table had a big place card that read "Class Of 2007, Black And Bling Formal Ball." Under the card we placed the small ball and flowers. We also scattered a few around a black vase filled with white flowers on the refreshments table. If you want to make the decoration a little more steady, try painting a small square of wood or metal and gluing to the bottom of the ball. This will give a wider platform and make the base heavier.